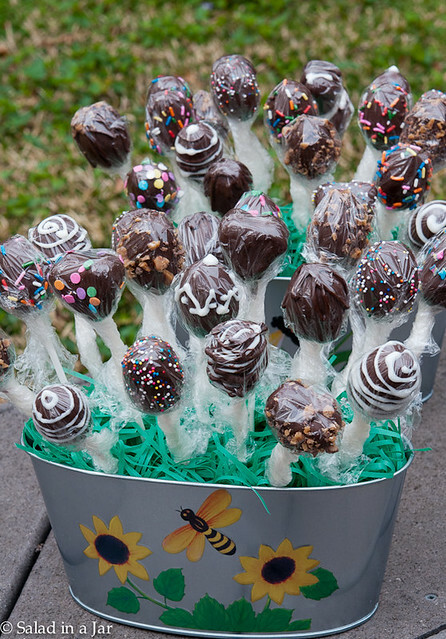 These Chocolate Cake and Ganache Pops are egg-shaped, made with my favorite chocolate cake and chocolate ganache, then dipped and decorated. It was a passing comment that got me to thinking. My boss recently mentioned she regularly takes treats to show her appreciation to the people who care for her aging relative. She inspired me to consider what I could do for those who watch after my mother. Then it hit me. 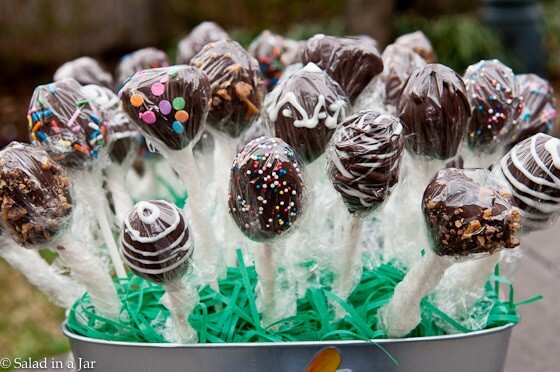 Cake pops! They are already portioned, individually wrapped, don’t need refrigeration, and stay fresh for days. Perfect for a break room snack …or office parties, showers, visiting grandkids, bribes, etc. I’m no fancy cake decorator. Perhaps you’ve noticed. But with a few sprinkles and some small zippered plastic bags with a snipped off corner, you can dress these cake pops up just enough to make them special and show somebody you care. It is not my intent, nor am I qualified to give you a detailed cake pop tutorial. Visit Bakerella for that. Get the how-to here. Rather, I have recipes to share. Most people make these pops with cake crumbs from a mix and a can of frosting to “glue” the crumbs together. I prefer to make this Chocolate Cake with Yogurt and use chocolate ganache instead of frosting as the “glue”. It makes for a completely decadent treat that is not so sugary sweet. My husband wants me to tell you that you need a plate to eat these, unless you eat them in one bite. Bake cake. Allow to cool completely. Crumble into a large bowl. Make ganache and immediately pour into a bowl of cake crumbs and mix lightly with hands (another use for exam gloves in the kitchen). Chill. Use an ice cream or cookie dough dipper to portion into balls. Roll with hands or on wax paper until smooth. Chill. 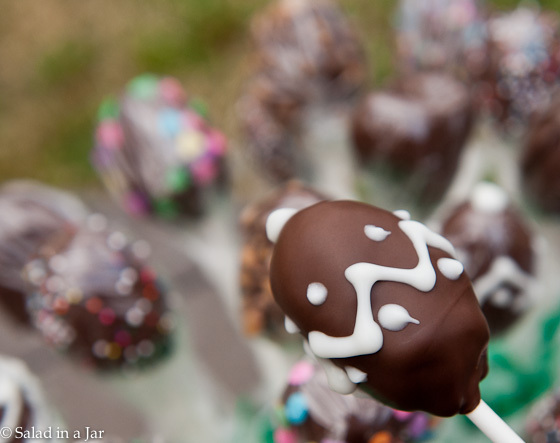 Dip cake pop sticks into melted chocolate coating (Kroger’s chocolate coating is good enough for me) and then into a cake ball. Chill. Place melted chocolate coating into a narrow jar or cup. Carefully dip each chilled cake ball into chocolate and tap on the side several times to let excess coating drip back into melted chocolate. Place cake pop into styrofoam square (I used styrofoam left in big TV box) to dry. It won’t take long. If you want to decorate with sprinkles, do it quickly before chocolate gets hard. If you want to decorate with chocolate, put a small amount of melted chocolate coating (white or chocolate) into a plastic pint or snack-size bag. Seal. 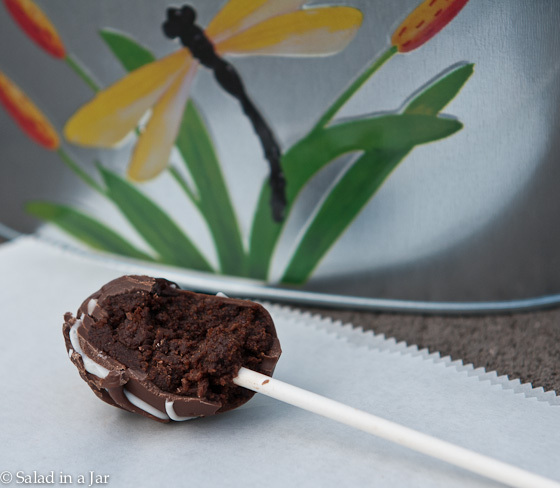 Snip a tiny hole off of one corner and allow chocolate to drip over cake pop in the pattern of your desires. This recipe is adapted from Epicurious, then halved, in keeping with my philosophy about making desserts in smaller sizes. It still makes 50-60 cake pops depending on the size. I got the silver containers. a cube of styrofoam for the inside to anchor the pops, and the Easter grass all from the dollar store. Chop semi-sweet chocolate and place in small bowl. Add coffee and allow to sit while chocolate melts stirring occasionally until smooth. In large mixing bowl, mix eggs until lemon-colored and thick. Add oil, yogurt, vanilla extract, and melted coffee/chocolate mixture and mix until well blended. Pour into a greased and floured (or lined with greased wax paper) 11 x 7 inch rectangular pan (or similar 10-cup pan). Bake for 50 minutes or until toothpick poked in the middle comes out clean. Nutritionals do not include dipping chocolate or anything you might add to make cake pops. Yummy as usual! Thanks for making for us to enjoy! Really like that you used ganache to hold the cake portion of these together. What a lovely way to say thank-you and that you appreciate the kindness of others. Hope you had a wonderful Easter. I think giving these away are a great idea, especially since I would eat them all if I kept them around our house! They are so so delicious!